ST. GEORGE -Seventy-two inches. The Dixie Rebels will be thinking about those six feet, those two yards for the entire off season. That turned out to be the difference between winning and losing Saturday night in the Rocky Mountain Football League’s semifinal match-up as the Wasatch REVolution held on for a 16-10 upset of the top-seeded Rebels. Just like in the regular season game between these two teams, the Rebels found themselves down 10-0. The Rebels attempted a comeback and almost pulled it off, but as time ran out, Diarra Fields completed a 35-yard pass to Brennan Adams who was tackled on the 2-yard line, leaving the Rebels just short of what could have been the winning touchdown. The Rebels had taken over on their own 35-yard line with 55 seconds to go and Fields and the rest of the Dixie offense worked the ball down to the Wasatch 37 with 3.8 seconds to play. After a mad scramble, Fields found Adams at about the 10-yard line. But the speedy receiver was gang-tackled before he could force his way into the end zone. It was a very different game from last year’s RMFL Championship as defense controlled things. The Rebels defense gave the REVolution problems with the pass rush. They were constantly forcing REVolution quarterback Charlie Peterson into uncomfortable situations. Dixie’s defensive line had five sacks and 12 total tackles for a loss. The REVolution defense knew that Fields was injured coming into the game and used that knowledge to readjust their defensive game plan. J.D. Dawson, safety for the REVolution, said the plan was to leave the normally mobile Fields and focus on the receivers. The game plan paid off as Wasatch held the Rebels to their season low in scoring. Neither team was able to score in the first half, but on the first possession of the third quarter the REVolution were able to get a nice drive going. After they got into field goal territory, the Rebels’ defense was finally able to get a stop, forcing a field goal. Down by three, Fields dropped back to pass and was intercepted by the REVolution and taken back for a touchdown to put them up 10-0. At that point, the Rebels tried something different. They moved Dallas Irvin from receiver to running back and had Irvin and option QB Misi Tupe put together a nice drive. They both took carries on a drive that put them in range for Steve Pulver to knock through a 48-yard field goal, making it a 10-3 game. Peterson completed a deep TD pass with under seven minutes in the game to push the lead to 16-3, but the REVolution missed the PAT. Down 13 points late in the fourth quarter, the Rebels were forced to go for it on fourth down. Fields found Adams deep to keep the game alive and then hit Irvin for an 18-yard touchdown pass with 5:10 left on the clock. The extra point by Pulver made it a 16-10 game. The Rebels did not attempt an on-side kick, but decided to trust their defense to get them the ball back. The REVolution were able to pick up a few first downs and since the Rebels only had one time out, the REVolution were able to burn a lot of time off the clock. Finally, on a third and two with just over a minute to play, Wayne Alofipo was able to blow right through the offensive line and sack Peterson. That play forced a punt and got the Rebels the ball back 65 yards from the end zone with 55 seconds left and no timeouts. 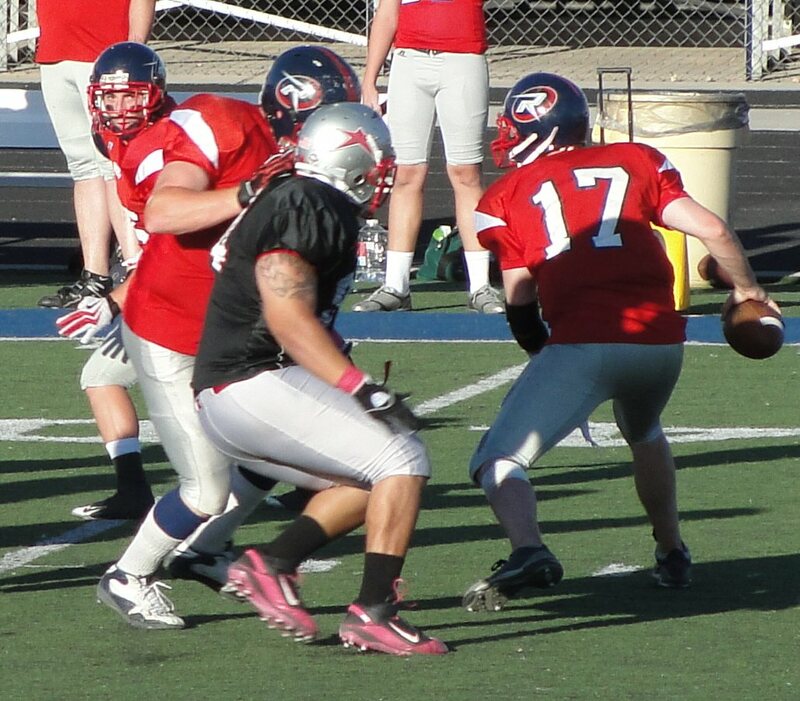 The Rebels responded with Fields completing passes to Irvin, Cameron Murdock and Andy Stokes to pick up 28 yards. With the ball on the 37-yard line, the Rebels had time for one last play. Fields found Adams in the northwest corner of the field and completed the pass, but Adams was unable to elude the Wasatch defenders and was tackled just short. Dixie finishes the year with a 7-2 record and will have to hand over its crown as RMFL champs. Wasatch, 7-3, will play for the league title at the winner of the Utah Stealth-Utah Shock match-up. Those two teams met late Saturday night at Jordan High in Sandy in the other semifinal. If you missed the game, be sure to tune into Blake’s Take Tuesday from 5-6 p.m. to hear sports commentators Patrick Black and Leo Wright break down the action from the game on KZNU Sports Radio – 93.1 FM 1450 AM – or online streaming live on KZNU Sports website www.kznusports.com.